Using the genre of fictional documentary permits British director Gabriel Range to get to the heart of what’s gone terribly wrong in the United States since 9/11. Death of a President is above all, a thoughtful and compassionate, if deeply distressing exploration of the ongoing erosion of independent thinking — of the loss of freedom of thought — in the United States today. The widespread knee-jerk condemnation by large numbers of Americans in advance of this film’s release only demonstrates the very problem that preoccupies Range. 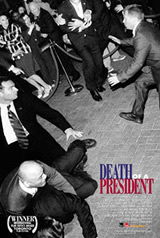 For the most part, Death of a President is structured as a made-for-TV documentary, set in a fictitious 2008 looking back at the fictional assassination in December 2007 of the actual two-term incumbent George W. Bush. Overall, the tone of the fictional documentarian is highly respectful, even reverential, of the President: these are the heart-felt opinions and expressions of adulation clearly visible in actual mainstream news media coverage of the Bush White House. Indeed, the very people outraged by a film they have never seen would most likely find here persuasive argument to return the actual living Bush to office for a third term, if not for life. The bulk of the film consists of interviews with numerous fictional individuals close to the President, interspliced with hand-held footage and TV news clips of fictional anti-Bush demonstrations. The demonstrators’ point of view is repeatedly demonized by abundant commentary by Bush’s aides and supporters. Framing the entire film is an extended oral history interview with Zahra Abi Zikri (Hend Ayoub), wife of a Palestinian-American Jamal Abu Zakri (Malik Bader), the man with the unfortunately right-fit ethnic profile singled out for culpability by both corporate media and US government watchdogs as the assassin. Laying bare the process by which Zikri was framed (in a chilling nod to Truffault’s Fahrenheit 451), near the end of the film Death of a President goes on to explore and interview the actual (fictional) assassin, in a plausible scenario invoking the muddled patriotism of Timothy McVeigh and the US government siege of the Branch Davidian compound in Waco, Texas. The brief shots of the act of assassination, scarcely more than a minute or two of screen time, hark back to the media images of the attempt made on Ronald Reagan. Range sets the crime scene in Chicago during an important rally for the Republican cause, thereby invoking the 1968 Democratic National Convention and another era of deep polarization, as the US was veering toward open civil war. Death of a President has a subtle, but gradually overpowering sense of 1984 to it, as a kind of textbook case of how mediated reality seems increasingly to follow predictably scripted fictional scenarios. As a former TV journalist, Range is finely tuned, tracing the role corporate news media in the United States plays in creating a consensus narrative and rehearsing the masses in how to properly respond to crises. The true focus of the film is a consideration of how 9/11 has allowed US authorities to rescript a new Cold War (the eternal war, the faceless enemy, the need for endless sacrifice, the need to remain in a state of perpetual fear).